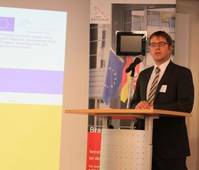 On March 25th 2011, the information event of Urb.Energy on „Sustainable energy solutions in the urban and re-gional context – reflection on EU support“ was organized in the Representation of the Land Brandenburg to the EU in Brussels, Belgium. 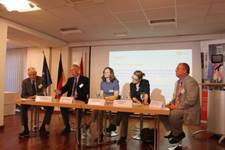 The panel discussion was moderated by Mr. Hans-Jörg Duvigneau from the Competence Center for Major Housing Estates. 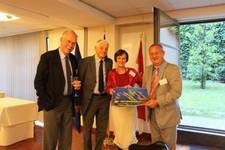 They two representatives of the EU Commission Ms. Michaela Holl and Ms. Maud Skäringer discussed with Mr. Andrzej Rajkewicz and Mr. Peter Busch what can be learned from the findings of the presented projects for the EU support policy. The minutes, presentations and agenda of the event are available here.